These pickle cupcakes aren't for the faint of heart, but the secret ingredient is one you'll sip even before adding to the mix. When we ran into a recipe for pickle cupcakes, we were skeptical until we saw that the secret ingredient is bourbon. We figure that we might as well start with a recipe that includes bourbon to start, just in case, because bourbon fixes most things. 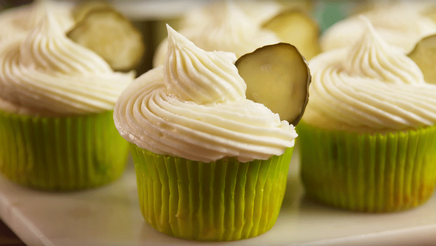 Would you try Pickle Cupcakes?